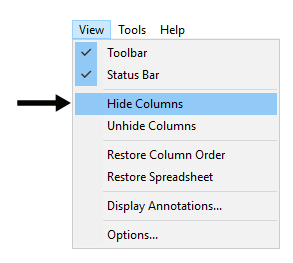 Columns may be hidden or unhidden using a variety of methods. First, columns may be hidden by selecting the column(s) to hide and using the Hide Columns command in the View menu. Or, individual columns may be hidden by right-clicking the column header and choosing the Hide command from the pop-up context menu. Finally, columns may be hidden by dragging the boundary on the right side of the column header to meet the boundary on the left side of the header. There are also several ways to unhide columns. 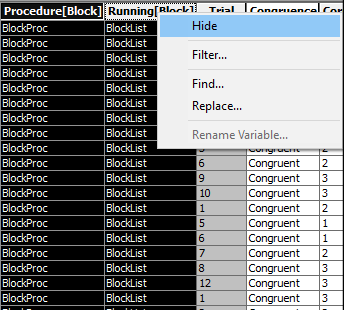 To unhide one or more columns, use the Arrange Columns command in the Tools menu. The Arrange Columns dialog box will be opened to display all of the columns currently displayed or hidden. 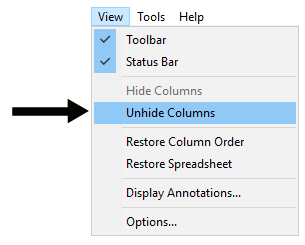 Unhide a column by selecting the column name and using the Add button to move the column from the hidden columns list to the Show list. The unhidden column may be positioned in the list of displayed columns using the Move Up or Move Down buttons. To unhide all hidden columns, use the Add All button in the Arrange Columns dialog, or the Unhide Columns command in the View menu. When using the Add All button in the Arrange Columns dialog to unhide all hidden columns, the hidden columns are placed at the end of the Show list, and are placed as the last columns in the spreadsheet. 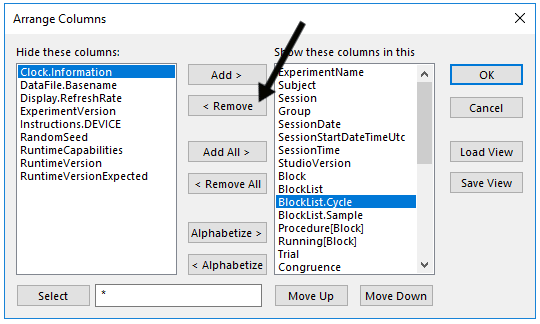 Use the Move Up or Move Down buttons in the Arrange Columns dialog to reposition the columns if desired. When unhiding columns with the Unhide Columns command, the columns are shown in their original placement in the spreadsheet. E-DataAid provides a mechanism on the main interface toolbar to apply Column Definition files. A Column Definition's purpose is to save the the layout and whether columns are hidden or not in a file. Columns can be hidden and arranged in E-DataAid by using the Arrange Columns dialog. When a Column Definition is applied to an .edat3 file, the column visibility and column order configure to match what was specified by the Arrange Columns dialog. If the Column Definition contains a column that does not exist in the .edat3 file, that column is ignored and the remaining columns become re-aligned so the column order is contiguous. If the .edat3 file contains a column that does not exist in the Column Definition, that column is treated as visible and is be placed after all the columns that do exist in the Column Definition.